Baylor University has enrolled 15,029 students -- the university's largest overall enrollment -- as well as the most academically prepared freshman class in Baylor's 166-year history, according to official 12th-day enrollment statistics compiled by the Office of Institutional Research and Testing. Baylor's previous overall enrollment record was set last fall at 14,900 students. 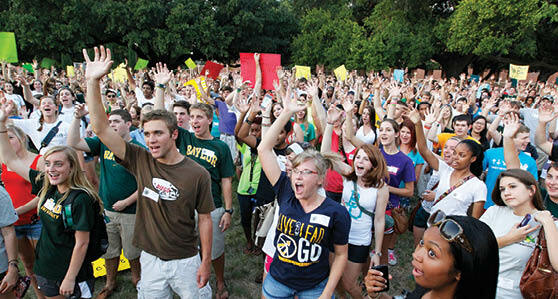 The university enrolled 3,033 high-achieving freshmen, who were among nearly 39,000 students applying to attend Baylor. The academic quality of the freshmen also set records, with the entering class averaging 1236 on the SAT and 27 on the ACT. Seventy-four percent of Baylor freshmen finished in the top quartile of their high school classes. Diversity among the entering class remains strong with minority enrollment at 32.5 percent, the fourth consecutive fall above 30 percent. 213 students in Baylor/U.S. Army affiliated graduate degree programs. In addition, Baylor enrolled one of its largest, most academically prepared and diverse groups of transfer students, with more than 40 percent coming to Baylor from four-year colleges and universities from across the United States. They also represent 15 countries. The Office of Institutional Research and Testing report showed that the retention rate among Baylor's freshmen from fall 2010 to fall 2011 jumped from 81.9 percent to 85.4 percent. "It is unusual for a university to increase retention in one year by even 1 percentage point. Our 3.5 percentage point increase is phenomenal," said Dr. Sinda Vanderpool, assistant vice provost for enrollment management. Vanderpool attributed the increase, in part, to a concerted university effort, beginning with the first contact point with an admissions counselor, to help new students work towards graduation. "At Baylor, we believe that every square inch of our campus is a classroom. We have challenging academic programs, yet we provide engaging experiences and excellent support. The 2010 cohort of students was also academically very well prepared, so that is certainly a contributing factor for retention," she said. "We organized a retention leadership team to make sure that retention was at the forefront of everyone's minds and to collaborate in our efforts, and I think that's what got us to where we are," said Brandon Miller, BA '94, assistant vice president for student success at Baylor's Paul L. Foster Success Center.